- volume and chapter numbers are usually in Roman numerals. 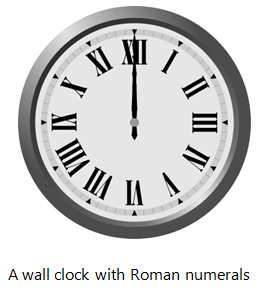 -	hour marks in some analog and antique clocks are in Roman numerals. -	suffixes for people sharing the same name across generations or names of pope or monarchs (e.g. King Phillip II) are in Roman numerals. Each of the seven letters has an equivalent value. Familiarizing these letters and their respective values is important in successfully reading and writing Roman numerals. How to READ Roman numerals? Even though there are only 7 letters used in the Roman numeral system, the arrangement of these letters is what the corresponding value depends on. CX and XC may have the same letters used but they have different values. Also, not all combinations from the 7 letters can actually be a Roman numeral. CL is a Roman numeral but LC is not. 1. 1.	Letters I, X, C, and M can be repeated up to 3 times while the rest(V, L, D) can be used only once. Is CCC a Roman numeral? 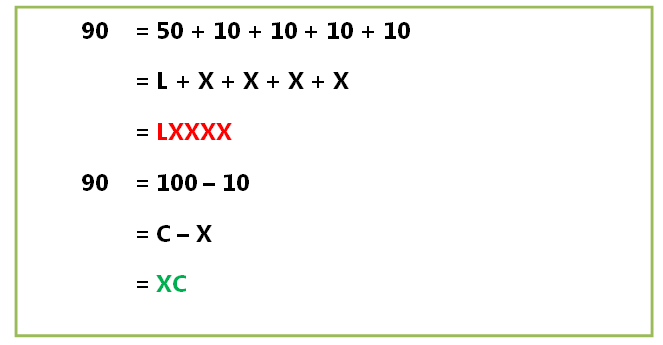 YES, since C = 100 which is a multiple of 10 and multiples of 10 can be repeated up to 3 times. Is LL a Roman numeral? NO, since L= 50 which is a multiple of 5 and multiples of 5 can be used only once. Is IIII a Roman numeral? NO, a letter can be repeated up to 3 times only. 2. Add the values if the letter has a value greater than or equal to the value of the letter next to it. The leftmost letter (M) has the greatest equivalent value while the rightmost letter (I) has the smallest equivalent value. What is the value of the Roman numeral XV? X = 10 is greater than V = 5, so add the values. What is the value of the Roman numeral CII? C = 100 is greater than I = 1, so add the values. 3. Subtract the values if the letter has a value less than the value of the letter next to it. Start at the left side and find a pair of letters in which the value of a letter is less than the value of the letter next to it. 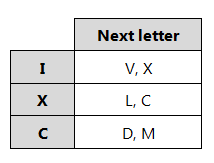 The table shows the allowable next letters that have a greater value. Take note that V, L, D, and M should not have letters next to them that have a greater value. Subtract the smaller value from the greater value. After that, find another pair of letters having the same condition. What is the value of the Roman numeral IX? I = 1 is less than X = 10, so subtract the values. What is the value of the Roman numeral CDIV? C = 100 is less than D = 500, so subtract the values. I = 1 is less than V = 5, so subtract the values. 4. A bar line on top of the letter indicates that the value is increased by 1000 times. Multiply the value of the letter by 1000. What is the value of the Roman numeral `bar(X)`? Since it has a bar line on top, multiply the value by 1000. What is the value of the Roman numeral `bar(IV)` ? Take note that the bar line is applicable for numbers greater than or equal to 4000 . How to WRITE Roman numerals? Complete familiarization of the 7 letters and their respective values is vital in writing Roman numerals. Also, taking note of the principles in reading Roman numerals will help verify if it is written correctly. Let us use the problem below. Write 92 in Roman numerals. 1. Express the number as a sum. Use the digits for the sum and take note their respective place value. 2. Determine the two letters where each number is between. 90 is between 50 (which is L) and 100 (which is C). 2 is between 1 (which is I) and 5 (which is V). 3. Use addition and subtraction equivalents of the numbers. As addition and subtraction parts, the number 10 (X in Roman numeral) is chosen instead of 5 (V) and 1 (I). 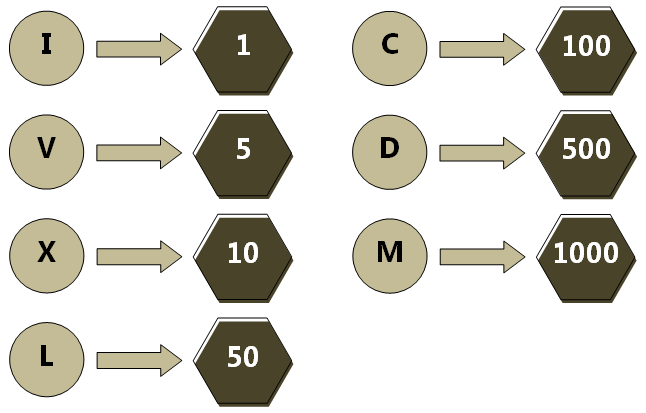 With these, less numbers are used which results to less letters being used. No other Roman numeral which is less than 1, so the number 1 (I in Roman numeral) can be used as addition and subtraction parts. 4. Convert each equivalent into Roman numeral. Among the two scenarios, only one is valid. LXXXX is not a Roman numeral since a letter can only repeat up to 3 times only. Thus, XC is a Roman numeral. II is a Roman numeral. 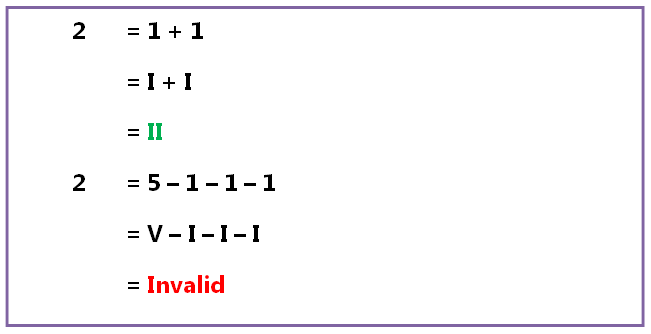 The subtraction equivalent is invalid since only a pair of letters is required. 5. 5. Combine the Roman numerals. Put the Roman numerals next to each other. Write 547 in Roman numerals. Step 1. Express the number as a sum. Step 2. Determine the letters where each number is between. 40 is between 10 (X) and 50 (L). 7 is between 5 (V) and 10 (X). Step 3. Use addition and subtraction equivalents of the numbers. Step 4. Convert each equivalent into Roman numeral. Step 5. Combine the Roman numerals. Write 9900 in Roman numerals. 9 is between 5 (V) and 10 (X). Take note that 9000 is a multiple of 1000 which is greater than 4000. The bar line is applied for this. Consider the thousand’s digit only which is 9 for this problem. 900 is between 500 (D) and 1000 (M). Step 5.Combine the Roman numerals. *Put a bar line on IX to indicate that it is a multiple of 1000.